The Boathouse at Barn Elms is a unique facility that offers the opportunity for adults and young people to learn to row on the River Thames. You don’t have to be a member, and all abilities are encouraged. A unique facility that offers the opportunity for adults and young people to learn to row or kayak on the River Thames. Our adult group rowing courses are for anyone over 18. Courses are usually 5-7 weeks long and run throughout the year. Why not get together with a group of friends a make the most of the River Thames? Beginner and intermediate courses are available. 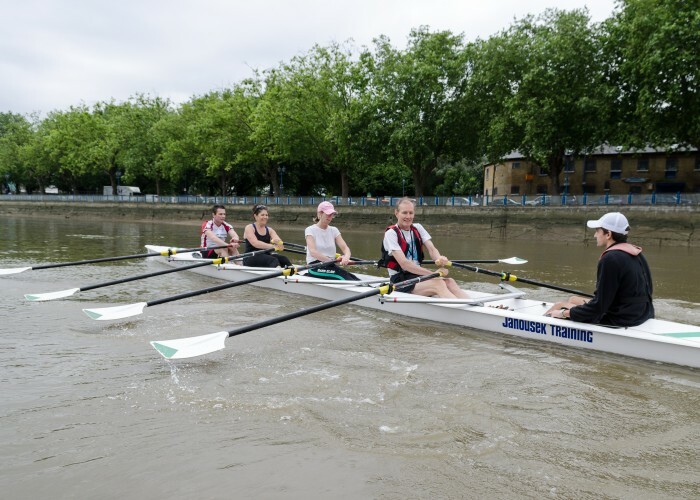 We offer beginner and intermediate level rowing courses for adults (18+) all year round. Courses consist of one 1.5hr session a week for 6/7 weeks. Note: while we offer courses at the above times, we require a minimum of four rowers for a course to run. post the form with a cheque enclosed (payable to Enable Leisure) to Barn Elms Boathouse Queen Elizabeth Walk, Barnes, SW13 0DG. Once payment and form have been received you will receive a confirmation email of your place. We offer private rowing lessons for £50 per hour if you want to head out with a coach to yourself. Please contact the office for availability and bookings. If you are interested in heading out on the river more regularly, then you may like to join Barn Elms as recreational member. For £28 a month you will be able to take out a boat at the available times and row as much as you like. These sessions are unsupervised on the water so are currently only open to members that have completed our tideway navigation test and deemed to be a competent sculler by a coach. Speak to staff at the office for more information. The timetable for the spring term can be found HERE. Bookings for the summer term open on Monday 11th February for current rowers and Monday 25th February for new joiners. Please see below for booking procedure. Juniors keen to compete for Barn Elms will need to join the performance squad. If you’re interested in joining the squad contact Charlotte Lennox to discuss the requirements of being a squad member. We work with many local schools in order to give their students the opportunity to get out on the River Thames. Rowing sessions are available for year 7 students and upwards. Paddlesport (kayaking) sessions are suitable for year 4 students and up. Both activities can be booked in on a yearly or termly basis, or just as a one-off taster session. For more information please email Charlotte Lennox or call 02039590054. We often fill up very quickly for events so please contact us early to guarantee your space. Email us at mailto:bebh@enablelc.org. We are organising the teams to represent Wandsworth this summer in the London Youth Games rowing competitions. We are looking for rowers in school years 7 – 12 to take part in the regatta and indoor competition. Details to be released shortly regarding team trials. FAQs What kit should I wear? Any sports kit is suitable; however we recommend close fitting clothes such as leggings and thin t-shirt or long sleeve top. Try to avoid any baggy tops with pockets in the front as the oar handles can get caught. Do we need any of our own equipment? No. We provide all equipment required. Please just bring a pair of wellies for water-based sessions. Do rowers wear lifejackets? Generally not. In rowing only the coaches and coxes are required to wear lifejackets. However if you are not a confident swimmer we ca provide you with a buoyancy aid. Will my session run in any weather conditions? Sessions are very rarely cancelled due to weather. Session will sometimes take place in the gym/rowing tank rather than on the water if the water conditions are deemed to be unsafe. If it is raining the session will take place on the river provided rowers are wearing suitable kit and have dry kit to go home in after the session. If a course is showing as full on the website, will any spaces come available? Once a course is fully booked spaces do not usually come available. You would need to wait and join the next course, which start every 6/7 weeks for adults or every school term for juniors. Do you need to be a good swimmer to learn to row? No. We have a requirement that you must be able to swim 50m, otherwise you will need to wear a buoyancy aid. My child has turned 11 but is still in year 6. Can they start rowing? Unfortunately not. We will only take juniors from the September that they start in year 7. Courses run outside these times. Ebb tide flag warning system The port of London Authority has a flag warning system in place to help indicate the speed to the river to users. Everyone who uses the Barn Elms facilities must follow the safety requirements and navigation when rowing from the boathouse. The river safety rules apply to both users on a course and recreational rowers.